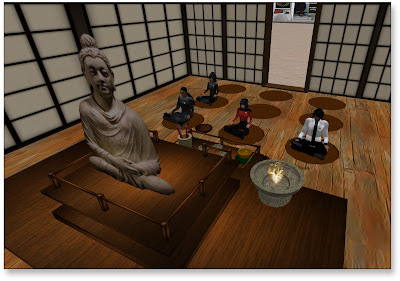 You know how it is, your just standing there building the odd buddist meditation room as Kendra (Koreeah Resident) was doing when debbydo pops her primmy hair through the door, of course I also had to have a look in the name of research and nosiness, followed by Damien firecaster. Talk of relaxation followed and we discovered we've all meditated at one point in our lives and shared a few interests and experience's on the subject. Seems we all in the end felt a sense on relaxation. So maybe Kendra's idea of a meditation class may end up as an interesting additional to the group. Awesome article! Thoroughly enjoyed reading it. Look at the build quality too. Kendra is an upcoming officer to watch! yep, That broke the silence, lol.